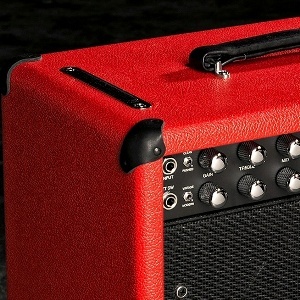 Love the look of those stylish leather corners that Mesa Boogie uses on their amps and cabinets? (I know, who doesn't, right?). 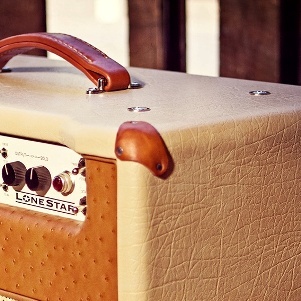 Well, truth is it's not that hard to duplicate that classic look on your next amp or cabinet project yourself. Here's how. • A piece of vegetable tanned leather, 5-6oz works best, and a piece about 6"x8" will be enough to make 8-10 corners (but if this is your first attempt you'll probably want to purchase enough leather to make a few extras, especially if you're going to dye the corners as it can take a lot of experimentation to get the color right. • A metal cabinet corner with a corner radius matching your cabinet, to use as a "mold". A Penn 1823 style corner with a 1/2" radius will work great for most cabinets. Unless your cabinet has the larger Marshall edge radius. • Leather dye. There are dozens of colors available from suppliers like Fiebings, and you can even mix different colors to create your own "in between" colors. • A leather pre-dye conditioner, which will help clean the leather so that it will take the dye evenly. 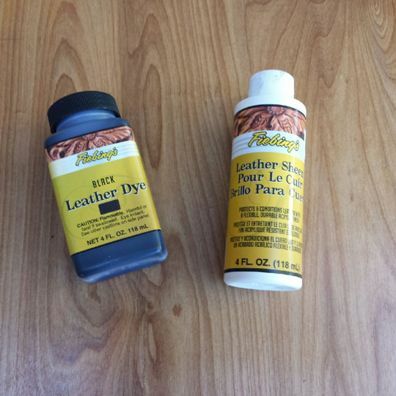 • Leather sheen or finish to apply to the leather once the dye has dried to help protect and condition the leather and it'll add a little bit of sheen. 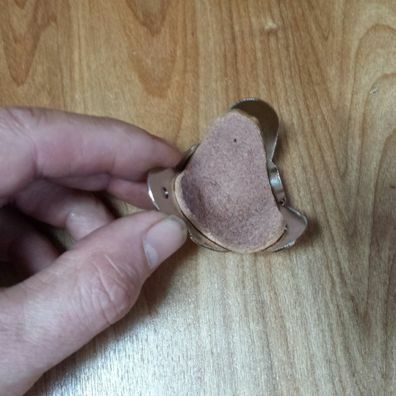 Additional items you'll need include something to cut the leather with -for this tutorial we used a sharp pair of heavy-duty sheers, but you could also use an exacto knife (leather is tough, so you'll have to have plenty of good sharp blades). A printer and paper (card stock actually works better) to print the patterns out with. And an awl or a sharp nail to prepunch the nail holes with. This isn't absolutely necessary but I found it much easier to install the corners with the holes prepunched in the leather. First print out the supplied pattern. You can click on the picture to link to a full size pattern, but even though it's full size you'll still probably need to resize it. 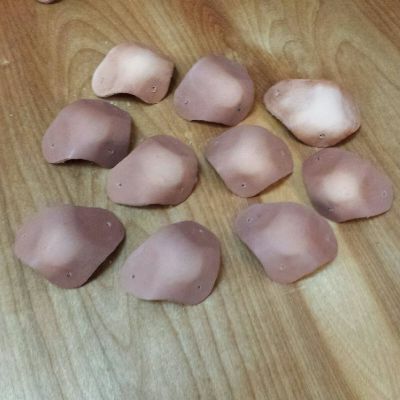 You'll see that the template has an inch scale on it that you can use to get the correct size. You may have to play around with your print settings to get it sized correctly. 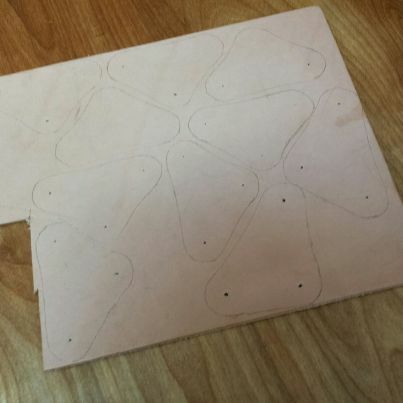 Once you have the pattern sized correctly, cut the pattern out to make a template to trace onto your leather stock. As I said earlier this will be much easier if you cut the template out of card stock. Use a sharp lead pencil to trace the pattern (don't use ink). 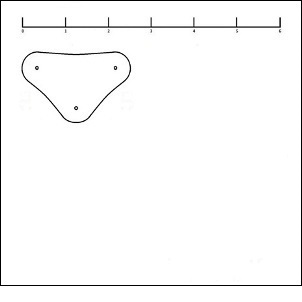 Also while you're tracing the pattern use the tip of your pencil to mark the position of the nail holes. 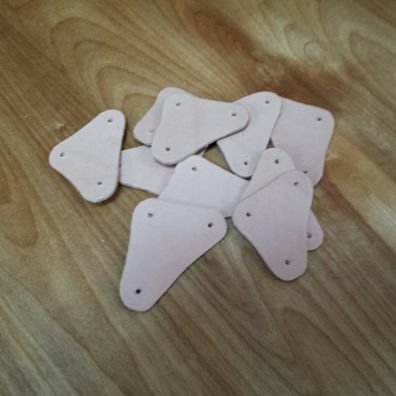 Once you have the corner pieces traced onto your leather you can cut them out. If you're cutting them out with scissors, it's helpful to cut them out a little outside the line (about 1/16" of an inch or so) and then go around them again and trim them to the final size. It's much easier to hold the scissors perpendicular to the leather and get a nice smooth cut if you're only trimming off a small amount. Here's the cut out corners. You should also punch the nail holes at this time. You'll find it much easier to nail the finished corners to the cabinet if the holes are already there. 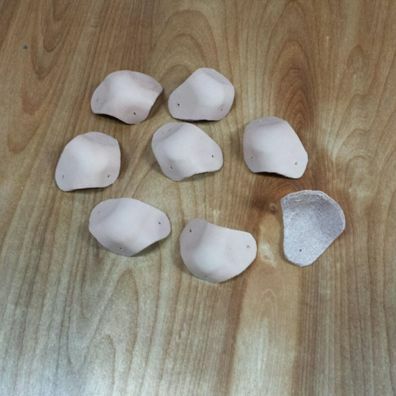 Once all the pieces are cut you can begin "molding" them to shape. This is where the metal cabinet corner "mold" comes into play. First wet the leather piece by dipping it in cool or tepid water (do not use hot water) for a few seconds until it's saturated. You'll know when it's ready when it becomes rubbery and pliable. 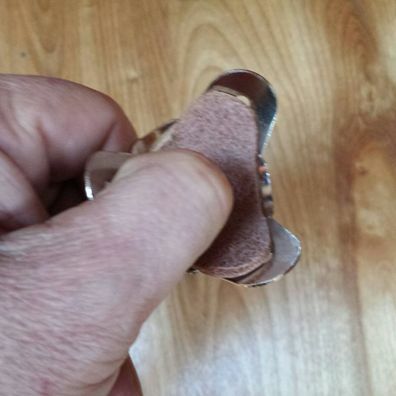 Now use your thumb press the leather into the back side of the metal corner so that the leather mimics the shape of the metal corner. Take care to position the leather so that it's centered in the metal mold. Using a 1824 style corner the to side screw holes in the metal corner were pretty much covered by the leather corner and the center point of the leather was about 1/4" below the third hole of the metal corner (see the picture). Press the leather firmly into the mold with your finger or thumb. Here's the leather corner molded to conform to the metal corner. Once you're sure that it's molded to shape you can take it out and set it aside and move on the next one. Here's freshly molded corners. They're still damp and it'll take them a few hours or even overnight to dry. Once the pieces have dried thoroughly you notice that they will be rather hard and stiff which is exactly what you want. Here's a couple of products you'll need to finish the job. Leather dye which is available in dozens of colors, and leather finish or sheen to help protect and add luster. Here's what the finished corners might look like. 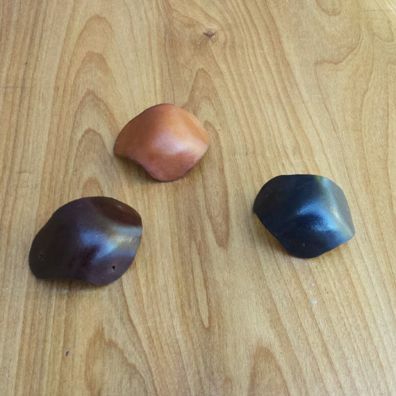 We experimented with three dye colors to (Black, Tan and Dark Brown) which will pretty closely match the vintage style leather amp handles available on our website. You'll also need some of these to install the corners. 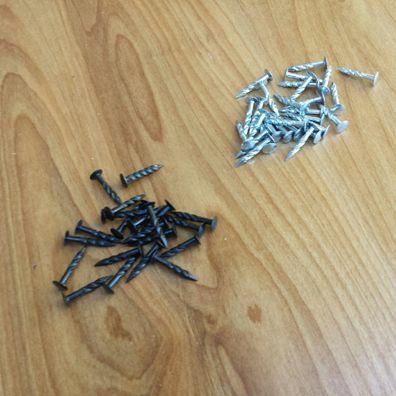 These little screw nails are available in black or zinc color. They can be pretty hard to hammer in so use caution. If you're working with really hard plywood, you might need to predrill the holes. These are pretty hard to find, but we have them available. Here's a link to our product page. 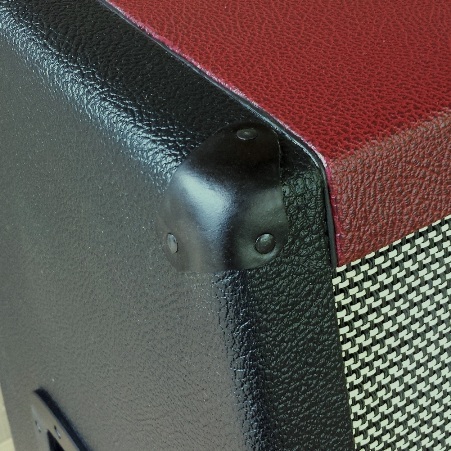 DIY leather corner installed on a two-tone (black bronco/british cabernet bronco) FRFR guitar cabinet. Leather corners were dyed black to match the black bead and piping on the cabinet. Looks amazing if you ask me.